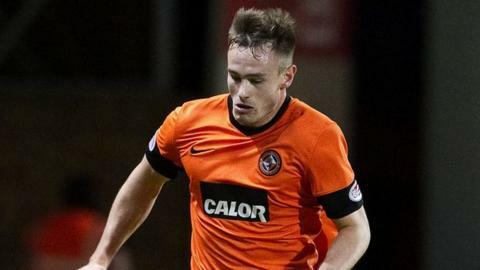 Dundee United pair Stuart Armstong and Keith Watson have signed contract extensions at Tannadice. Armstrong joined United in 2009, while Watson has been at the Tayside club for three years longer. Both players have committed to Peter Houston's side until May 2015. "Both players fully merit these extensions, and also features the excellent foundation players are receiving from the club's youth academy," said Houston. Watson, who was a part of the United side that won the Scottish Cup in 2010, was delighted to renew his terms. "It was an easy choice to continue playing here at Tannadice and carry on my football education here," said the 22-year-old full-back. "The coaching staff are helping me develop as a footballer and being told they wanted me here for the next few years is a massive boost personally." Scotland Under-21 international midfielder Armstong, 20, was also delighted to extend his stay. "This season is a big season for me and I have already been involved in all of our games so far," he explained. "I have goals that I want to achieve this season and beyond and signing this contract ensures I can focus on continuing my progress. "Tannadice is a great place to play football and knowing my future is secure means I can concentrate on fulfilling my goals on the park." The Tangerines' boss Peter Houston was also pleased about the players' decision. "Keith has been part of the first team squad for a few years now and this season has progressed even further," he said. "Stuart has shown already this season that he can play a large part in our team and make an impact in games. "He is an exciting player that brings additional pace and skill into our team. He still has some parts of his game to refine and I am delighted that he sees Dundee United as the best place to do so."